On Saturday October 27th, McMaster’s Climbing Club braved the rain to help clean up Mount Kelso in Halton as part of the club’s first ever Clean and Climb event. 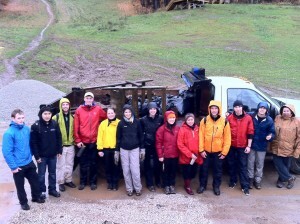 Although the climbing was postponed due to the weather, the clean up was a great success! Members of the club made quick work of the cliff edge and base bringing back mattresses, wooden frames, beer bottles and much more. The clean up even extended beyond the cliff to include sections of the Bruce Trail. The club executives would like to thank the Ontario Access Coalition, Halton Conservation and Mountain Equipment Coop for their help and support in organizing this event and look forward to future, similar events at cliffs across Ontario. All are welcome (including Mr. Sunshine)!